I remember dinners out with my grandparents at Tomacy’s, in Adams, when I was a kid. They were huge golf nuts, members at the Watertown Golf Club at Thompson Park, and I think dinner at the club – or any club – held an appeal for them that was more indicative of their glory days in the 60s and 70s, rather than the neon 80s of my childhood. Even then, the flagstone floor and planters serving as room dividers seemed dated; by the time I attended a wedding there in the early aughts, I remember wondering that a renovation hadn’t yet updated the space, but I did feel a bit of nostalgic affection for all that flagstone. Well Tomacy’s is now The Adams Country Club, and it has traded the 70s den feel for a warm, welcoming interior with some of ye olde flagstone still in residence, but everything else fresh and bright. The two spacious dining rooms and a big central bar are all framed by huge windows to let in the view of one of the prettiest, greenest nine hole courses around. The joint was jumping on the night our group visited, the families around us stuffing their faces merrily and getting just a bit raucous – which with the low ceilings made it a little loud, but fun. We just reconfigured ourselves so we could hear on another a little better, ordered a round of drinks, and joined right into the party. 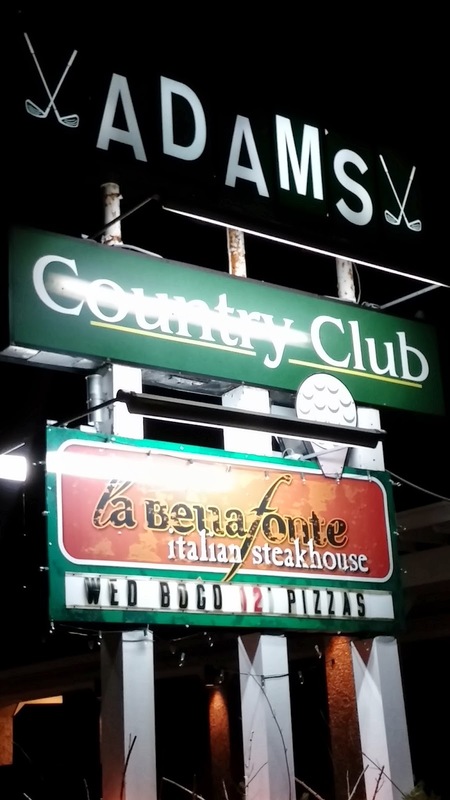 Adams’ CC is billing itself as an Italian steakhouse, which I find an intriguing concept, as I don’t necessarily think “steak” when I think of Italian food. The menu is a good mix of north country standards and some more creative dishes, though I hear the new chef/owner, Michael, is going to continue to evolve the offerings into the next year. And I get the steakhouse moniker, as the menu is offering several cuts of beef with steakhouse-style sides rendered with Italian flavors. Cool idea. A brilliant idea is the basket of focaccia brought to each table with a cup of bright green herbed oil for dipping. The bread is light, airy – less greasy than a lot of focaccia can tend to be, and bursting with the lively sharpness of fresh garlic and herbs when you dip a slice in that gorgeous oil. This is a mouthful of warm Tuscany in the middle of a long Northern New York winter. I have to tell you first about the mozzarella fritti ($7.99), because I am a hedonist and I do not believe in saving the best in any way. 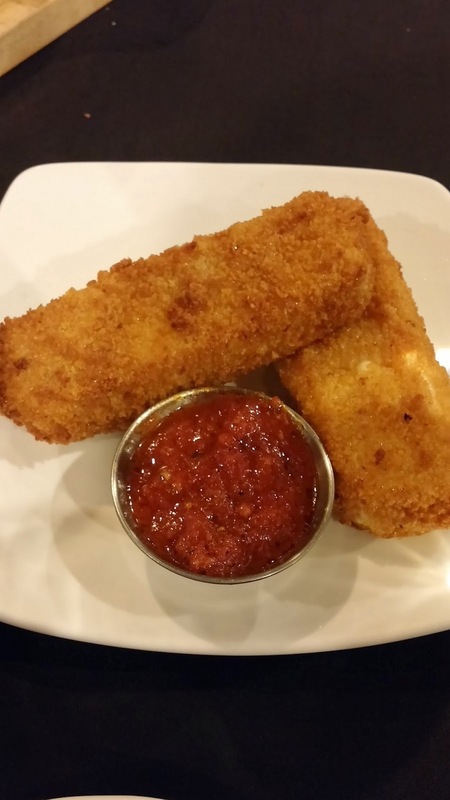 Guys, these are not some dinky sticks of fried cheese. Order this, and your waitress will bring you huge slabs of creamy, oozy mozzarella, breaded in the finest crispy shell of breadcrumbs and ready to dunk in a homey, deep, slow-cooked marinara. You know how a fat kid loves cake? Yeah well, Big Hungries love this appetizer, which has probably ruined me for all other mozzarella sticks. Does the phrase buttery wine sauce elicit the same mouthwatering response for you as it does for me? 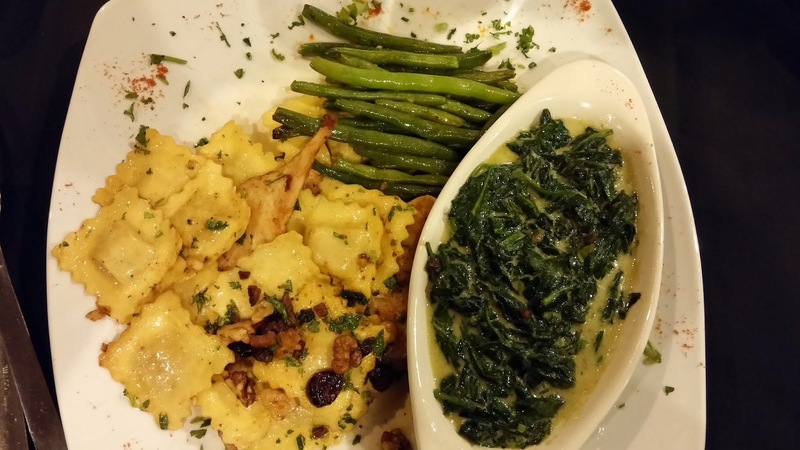 Then you should order the artichoke French ($8.99). You’ll receive a vast number of tender, lemony artichoke hearts just lightly battered with egg and then baked in this gooey, mildly citrusy, but mostly rich and buttery sauce that is utterly delectable. If you’re a dinner ninja (I am), you’ll scoop one these onto a slice of that fluffy foccacio bread, and then you’ll groan so loudly, they’ll hear you out in the bar. This is miles beyond the dinners I ate here with grandma and grandpa all those years ago. 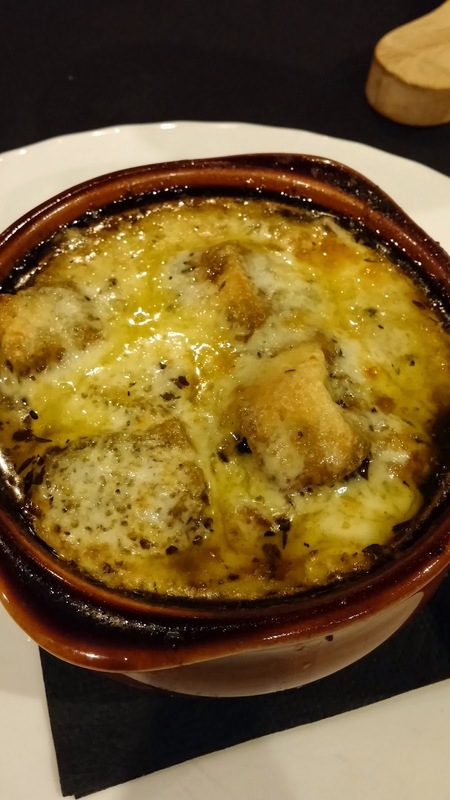 Tuscan onion soup ($4.99) is laced with pancetta and a load of thyme. The Tuscan comes in the form of cippolini onions, which are tiny, flattened out, really sweet yellow babies that cost roughly three times what your ordinary Spanish cooking onions would. The stock was also good and beefy – I would wager it was started with short ribs, which are quite fatty. The resultant broth was on the greasy side, but really well flavored. We guessed there may have even been a splash of beer in the mix. Rather than one disc of bread, you get several large crostini under the blanket of browned, crunchy cheese. The broth received mixed reactions at our table; I liked it, but I don’t know that it goes in my Top Five of onion soups. 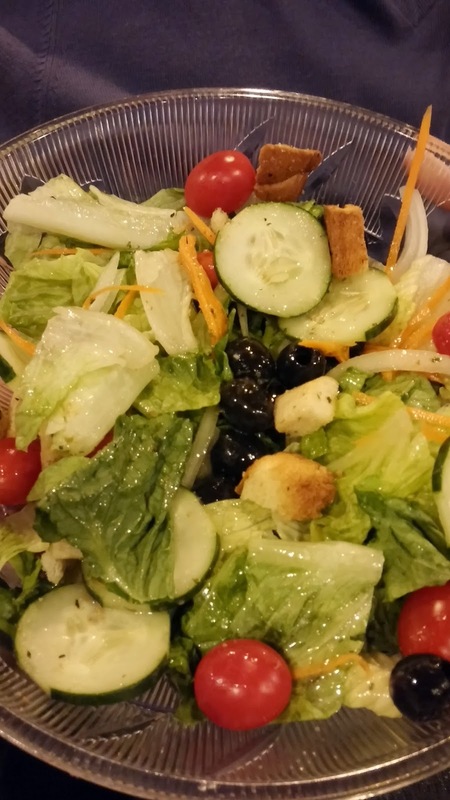 The salad course at ACC is served family style, which I always like. Family style service invites a conviviality that works well in this kind of setting, and the Italian dressing in the big bowl of salad here was mild and light, while the salad was packed with grape tomatoes, cucumbers and black olives. I would have welcomed some roasted red peppers and gorgonzola cheese in there to further drive home the Italian flavors and dress up this course, but that’s not to say it wasn’t tasty as is. At this point, dirty dishes started to pile up a bit on our table, and there was some lag time before our entrees came. But there were several really large parties in the dining rooms that night, and I’m betting that happened to be a crucial point in service for both, backing up the kitchen and requiring all hands on deck. As soon as our entrees did arrive, our cheerful waitress was back in fine form, friendly, helpful and attentive. 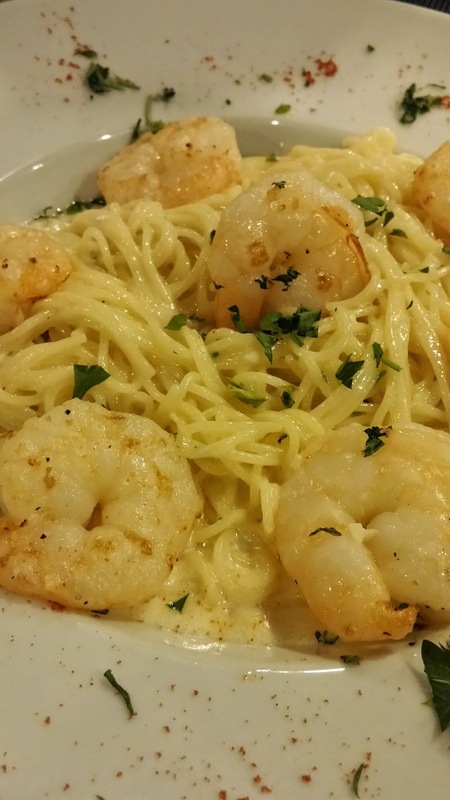 Scampi served over angel hair pasta ($19.99) was a carbohydrate lover’s dream, supremely creamy and delicately seasoned. The shrimp were succulent and plentiful up on top, and all I could think while tasting it was that if you had just been dumped, this would be perfect comfort food! 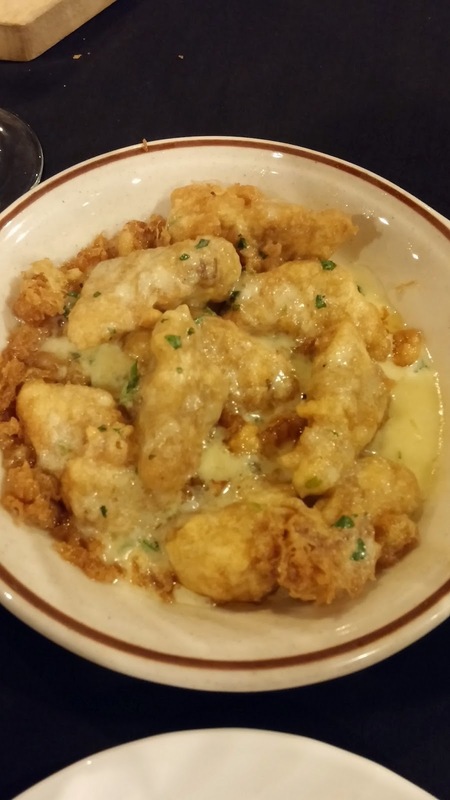 It wasn’t overly garlicky, just buttery, and there was a metric ton of pasta coated in the glorious scampi sauce. 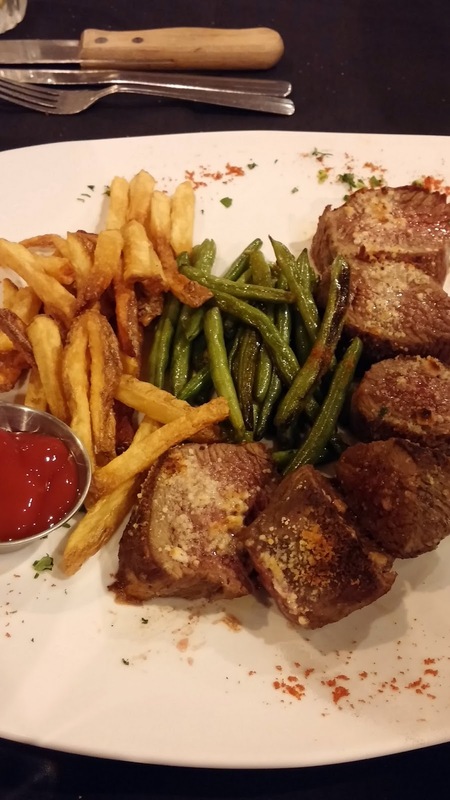 Sirloin al forno ($17.99) was served sliced, but every single one was cooked perfectly as ordered and still juicy, dusted with parmesan and well-seasoned. The green beans alongside were also perfectly crisp-tender and fresh, not frozen. And the French fries were hand cut! You know how strict I am about fries, and these lived up to my standards. The sides at Adams Country Club are top notch. Again, I would have really grooved on these as a kid, but I’ll gladly take them now. Macaroni and cheese ($4.99) was baked with a crusty cheese top and plenty gooey, just how you want it. I noted that I prefer a sharper cheddar in my mac, but my fellow diners shushed me and kept on plowing through it. The twice baked potato ($4.99) was excellence in potato form. You could taste the creamy sour cream and generous amount of butter mingling with the fluffy, earthy potato filling, and the top had that same browned, crusty cheese top as the mac and the soup. There should be a cult based on browned, crusty cheese. Chicken alla zucca ($17.99) was one of the more interesting and inventive dishes on the menu. The chicken was pounded thin and pan seared with just the lightest coating of flour. The two breast cutlets were smothered in a pile of al dente pumpkin ravioli, with some dried cranberries, diced pancetta, walnuts and fresh sage all coated in just a small amount of nutty, sweet browned butter. The ratios were right on in this complex dish, because too much of any one of the sweet ingredients could have pushed this into dessert territory – which would make the chicken a little bit weird. Instead, it was properly seasoned with salt and pepper, and the sauce, pumpkin and cranberries were all used with restraint. I loved it. 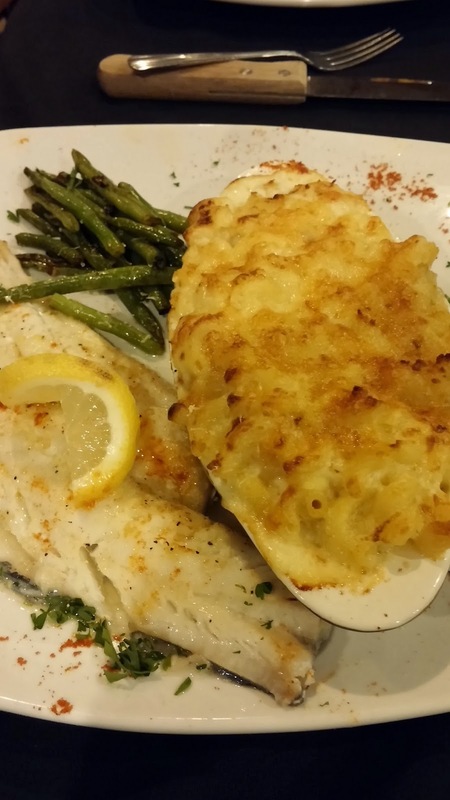 Haddock ($15.99) was ordered E.V.O. and lemon style – you can pick your prep for each of the four kinds of seafood offered – and roasted. It was very light and not overcooked, dressed simply with lemon and parsley. Fish is not my favorite unless it’s raw, but this was good. 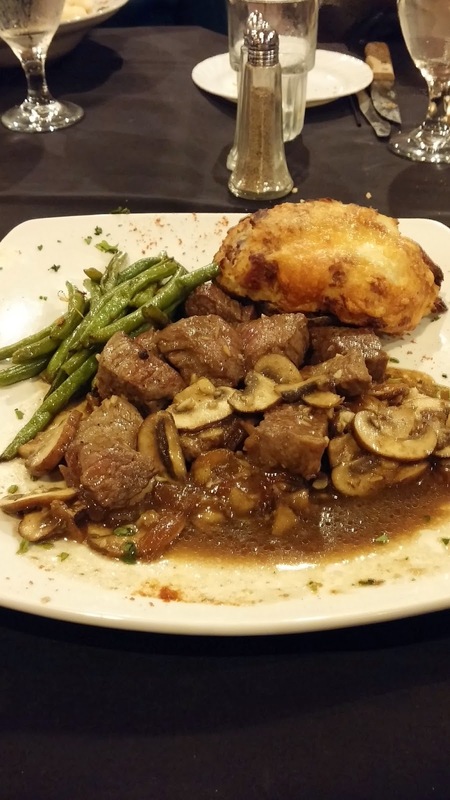 The sirloin tips were served in a garlic sauce with sliced baby bella (brown) mushrooms and onions. The meat in this dish was tender, but the entrée as a whole was probably the weakest we ordered. I felt like the sauce was a little muddy and lacked the complexity and depth we found with most of the other sauces that hit our table. It needed a little wine or some other kind of acid to kind of wake it up, you feel? We all shared a trifecta of desserts. My favorite, flat out, was the brownie sundae ($5). I wrote on my notes that it was insane, and I’m standing by that gut reaction. 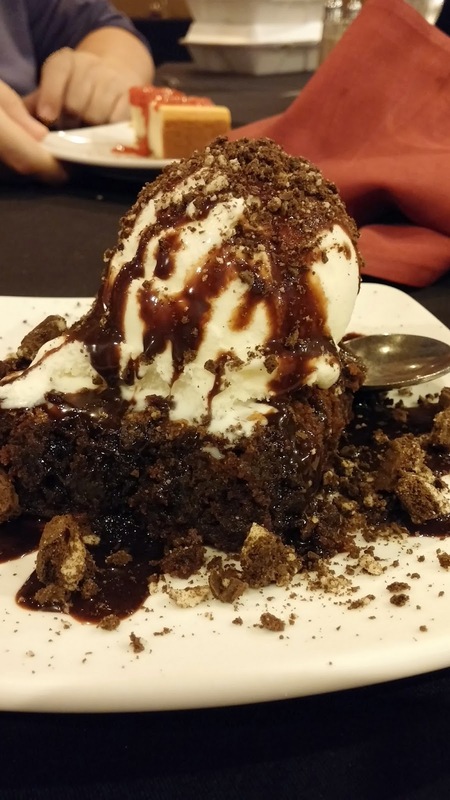 The brownie base of this behemoth was legit – fudgy, deeply chocolaty and homemade, first of all. Then they topped it with vanilla ice cream and some dark chocolate sauce, then jammed a couple of handfuls of crumbled up Oreos on top, just to prove that they were cool. Well done, guys. My favorite part was how deep both the brownie and the sauce were, but with none of the bitterness dark chocolate usually lends. 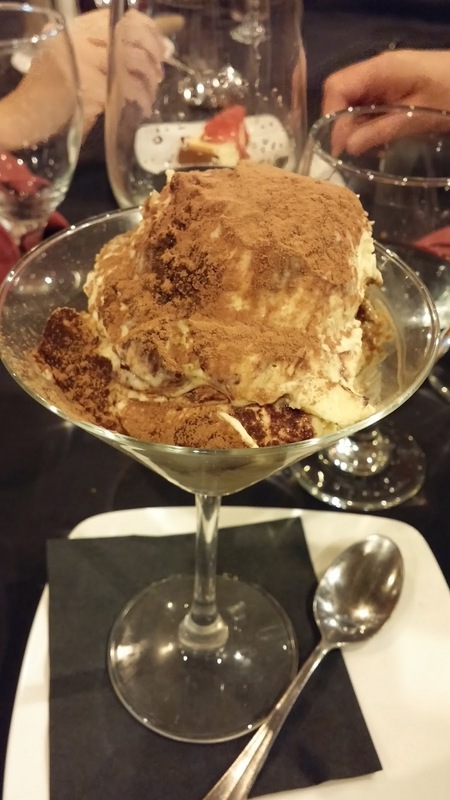 I didn’t much care for the cheesecake topped with strawberry sauce ($4), which was overly dense for me, but the tiramisu ($6.50) had great, mousse-like texture and robust coffee flavor. Dinner for five with two appetizers, three desserts and a couple adult beverages came to $155.62, and yes, these entrees are a bit higher in price than your standard family restaurant in the North Country, but what you’re getting for your money is not standard, nor are the portion sizes. I award Adams Country Club an eight on the Big Hungry scale, for the quality of the ingredients, the effort in the kitchen to make each dish special, and the fun but still relaxing atmosphere. Chef Michael Jeschawitz came out to greet a few of the tables, including ours, and was personable and seemingly eager to please his customers – I like to see that. This is not a meal that will absolutely knock you off your rocker with cutting edge cuisine, but it is a really wonderful, kind of different place to bring friends and family and have a well prepared meal with just enough twists and turns to tantalize your taste buds. I will say, the bathrooms were chilly, so bring a sweater, young lady! But mostly, bring your appetite. Order starters, order sides, and enjoy, because between live music in the bar and plenty of yum in the kitchen, La Bella Fonte isn’t your grandma’s dinner at the club.